Feeling thoroughly festive now. The Christmas roast is in the oven, the cheese is giving the fridge its own special aroma and the dessert is looking far too tempting to last the night. Our first guest is knocking together a trifle and another has just rung with the promise of a Haunch Of Reindeer (poor Rudolph). To all those descending on our place tomorrow – prepare to be over-fed and offered far too much alcohol. To every one else, feel free to pop in for a festive tipple, but if not have a wonderful Christmas and a happy and healthy new year. To go into details now would not be fair on El Presidente, as he has put some work into it…however, all I can say is I dissaociate myself entirely from it…You rabble will find out what it is come the update, but once I’d seen it I was groaning and moaning in severe pain and wondering how we could avoid lawsuits (something I’m also wondering about for the Mr. Dalek story, to be honest). Thematically, it’s a sort of sequal to Mr. Dalek Goes For A Glide, but that’s all I’m gonna say about it. Several mp3’s, some stories, some piccies including the aforementioned shot of Mr. Dalek – and I have to admit, watching the Smug One work on the pic in whatever the Linux equivelent of photoshop is, was very interesting…yes, Mr. Dalek needed touching up a little…after all, he needs to look his best and blend into his surroundings perfectly…. Last Friday, the 8th of December (aka European Day of the Wii) I found myself standing outside the local Game computer games shop. It was a wet Friday. It was also a dark Friday at 06:30 when I arrived. I was, initially, a queue of one. 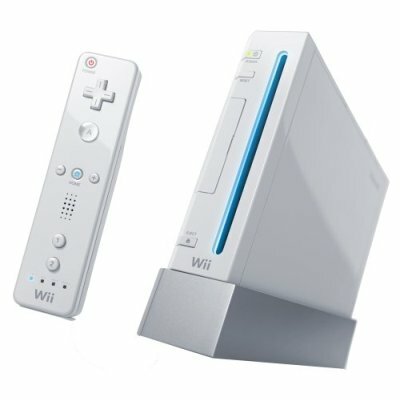 A few shops, in a few areas, had a midnight opening, some six and a half hours earlier, to celebrate the launch of the new Nintendo Wii games console. I too would have turned up at a midnight opening but here we had a 7AM opening instead which, I think, is preferable. For one thing I didn’t need to wake up any earlier than usual to be there for 06:30 (though I did defer my morning shower to save a bit of time – I didn’t think poor personal hygiene would mark me out from the others queuing up!). Another plus point being I had a full day to play with my new Wii before collapsing of exhaustion. So, there I was, huddled in the doorway of the shop to avoid the rain. Sadly there was nobody around the town centre that time in the morning to mistake me for a homeless person and throw money my way. I was surprised how late the queue was added to, 06:48 – I would have had time for that shower after all! The shop manager and an assistant arrived some ten minutes or so before that, I don’t know what they were expecting but I wonder if they weren’t regretting getting out of bed to open early for one person! Those last ten minutes saw the queue really form, by 07:00 there was no doubt the early opening was a success. I didn’t count the people (I was too focused on staying in the front as it wasn’t a queue so much as a huddle around the front doors) but it must have been 20 or so. That may not sound like much but for such an early start (and on a work day) it looked quite impressive. They weren’t kids, either, they mostly appeared 20 or 30 somethings. I expect the children and their families turned up later, trusting their preorders would be honoured. Eventually the doors opened (pretty much spot on 7, I think). We all charged. I was at the front and that’s where I was determined to stay. Victory! Bypassing the usual queuing mechanism I went straight to the end till. Preorder 1004. Wii console, Wii Play game (with second Wii Remote controller), The Legend of Zelda: Twilight Princess game, second Nunchuk controller. Check. No Component cable – they’ve been held up in customs. Customs? Dangerous things those TV connection cables, they could be used by trained assassins to throttle innocent members of the public. Anyway, the most important parts of my preorder were there and waiting. I’m not sure if they would have held back the accessories and games for me or not but the Wii itself had a 1004 note stuck on the box, I’m glad I played it safe. So, what’s the Wii actually like? It is as good as everyone has been saying. Back before they gave it the slightly ridiculous name of ‘Wii’ it was known by the codename ‘Revolution’. It’s only been around a few weeks worldwide (just one here, in the UK, of course) so it is hard to judge what impact it will have long term but it really does feel like a revolution in gaming. The motion sensitive ‘Wiimote’ controller adds an extra level of fun and does away with those increasingly complicated and obscure button covered controllers of old. I really think it is the dawn of a new age of gaming interaction (and maybe wider machine interaction). Time will tell on that but certainly using the wireless controller like a tennis racket, a rounders bat, a golf club, a sword, a snooker cue, a bowling ball, etc., is extremely good fun and that’s what it is all about. The Wii also appears to be trying to make a return to the old days of multiplayer games, friends or families gathered around a screen sharing the experience. This is a console designed for the living room rather than a child’s bedroom. Internet multiplayer is coming for the Wii (we are just waiting on the games that use it) but that just isn’t the same as playing together in the same room. In truth I haven’t had nearly as much time to use my Wii as I’d like, the Christmas Staggering Stories update (for one thing) is taking up most of my spare time now. Nonetheless I did take Wii Day off work to give it a good test. Wii Sports, the pack-in game, was certainly the immediate highlight, particularly the tennis game. Wii Play is quite good too, particularly the clay-pigeon shooting and the billiards. Rayman: Raving Rabbids is certainly amusing though can be a little frustrating, I need to do more of the single player game to open up the multiplayer aspects (an unfortunate design decision). The ‘triple A’ launch title, Zelda, is taking longer to warm to, for me. For one thing it looks quite bad scaled up on my TV (hopefully the component cable will help with that when they finally arrive) and, well, it looks like a big game (it’s an RPG type game) that will require more time to fully appreciate. So, apart from Zelda, all my games are really collections of mini-games. Those are particularly well suited to multiplayer, which is good as I was rather hoping to use the Wii as a party machine as much as anything else. A good few people have now had some of my Wii and all appear eager for more. That, more than anything else, is a testament for just how good the machine is. Since my Atari Jaguar, over a decade ago, I have had no interest in games consoles. The Wii has changed that. I still have little or no interest in the likes of the XBox and Playstation – they’ve just lost that sense of fun, instead concentrating on improving graphics and letting the gameplay stagnate. How many more Doom clones do we need? I’ve never owned a Nintendo machine before, never had any interest in owning one before, but their (new?) emphasis on fun, engaging gameplay for everyone has changed that. I’d recommend everyone takes a Wii. Despite urgent appeals by the U.N. I shall be singing in this year’s Mr Dalek Christmas story. It’s 05.26 and I’ve been working on the bloody thing since early evening …probably about a good 9 and a half hours. It’s my own fault, of course…I made a rod for my own back when I said, innocently to Karen, ‘I know, why don’t I write this year’s Mr Dalek story?’. I thought I’d be giving her more time to write something special – and hopefully I have….I just didn;t realise what a project our Skaroan friend was going to turn into this year. Apart from the fact it’s cost me nearly 20 quid on dvds, (you’ll see why), the track is nearly, you guessed it, seventeen minutes long and features my dulcet tones twice. You have been warned – as have the listening public as I thought it only fair to place a warning at the top of the track, lol. The Staggering Stories’ team know roughly what the story is this year – as for the rest of you, expect to see some childhood memories severly slaughtered…. as it is, the Christmas update is shaping up to be one of our biggest and best yet…there’s more then one mp3 on it’s way, that much I can tell you…..